In addition to being a nurse and having served as a coordinator and head of mission for different MSF projects around the world, Luis is now an operations coordinator based in Brussels, and is responsible for overseeing MSF missions in Burundi and the Democratic Republic of Congo, where new fighting has broken out. Day 1 - We are rebuilding the camp one more time. My head is busy in another part of the world with another reality, far away from here in the Democratic Republic of Congo. Here, it's just an approximate idea of what a camp should look like. Many times today when I was busy helping to set up one of the tents, I was thinking of how many tents are needed in eastern Congo right now. Even without some of the guides who have not arrived yet, it was amazing to see how quickly we set up this time. 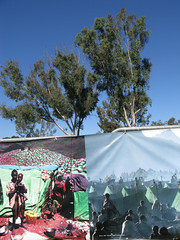 Just 2 hours 57 minutes for the full reconstruction of the camp, under a blue sky and in a magical place — Balboa Park. Objective: to inform, sensitize the public, and create an atmosphere where people can develop an interest and a willingness to learn more. This is really impressive, to have a view of the city of San Diego in front of you and to be in a such famous place - the home of two World's Fairs.